Withstanding the test of time, bituminous roofing products bring a proven track record to low-slope roofing. Bituminous roofing systems are known for their long service life, dependability, and exceptional waterproofing. There are two main types of bituminous roof systems, built-up roofing (BUR) and multi-ply, polymer-modified bitumen. The two-main polymer-modified bitumen membranes on the market are SBS and APP membranes. BUR systems have been used for more than 100 years in the United States. BUR systems are composed of alternating layers of oxidized bitumen and bitumen-coated membranes, often called felts or ply sheets. Ply sheets are generally reinforced with a dimensionally stable, high tensile strength fiber glass mat. BUR systems are surfaced with an aggregate or roof coating to improve the weathering capability of the system, and the redundant, multi-ply approach ensures the system provides dependable waterproofing for many years. Modbit systems consist of base plies and a cap sheet, sharing the main dependable waterproofing benefits of a BUR system. Modbit systems are high customizable. Cap sheets in modbit systems are surfaced with a mineral granule to increase the weatherability of the system, and cool roof granules and coatings can be used to reflect UV rays, increasing the long-term performance of the roof, and lowering energy costs for the building. SBS membranes are constructed with bitumen that has been modified with elastic Styrene-Butadiene-Styrene (SBS) polymers to form a “rubberized” asphalt coating. The coating is applied to a reinforcing carrier of fiber glass for high tensile strength and dimensional stability, polyester for superior elongation and tear strength, or a composite of the two. SBS membranes offer excellent flexibility, especially in cold weather. 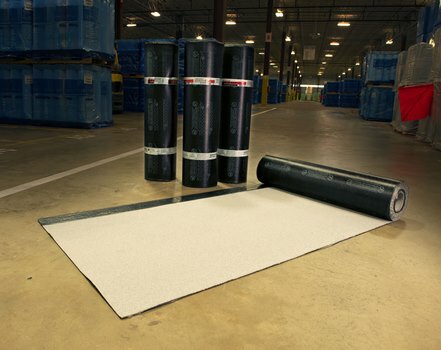 SBS membranes can be self-adhering but are generally installed with mopping asphalt or cold adhesive. APP membranes are constructed with bitumen that has been modified with plastic Atactic Polypropylene (APP) polymers, resulting in a coating with the highest temperature range and enhanced durability and toughness. The coating is usually applied to a polyester carrier mat, but a small amount of fiber glass products also exist. APP membranes are mainly torch-applied due to the meltability of the plasticized bitumen.